If the the 8th of March is Women’s day in Russia and the New Year is a holiday of hope, Victory Day in Russian Federation is the most solemn of all special occasions, when the whole country remembers the days of the WW II and the time when the Soviet Union defeated Nazi Germany. Every city on the territory of Russia has a memorial for all the soldiers who have sacrificed their precious lives during the war. According to the well known fact, the Soviet Union has lost almost 27 million lives. The most parts of the central region of the country were flattened by the war, a lot of women lost their husbands and many kids became orphans. Even now you can see the scars of the war here and there. 67 years after the end of that terrible time, a lot of people who survived those years have already died, but the memories are still alive. 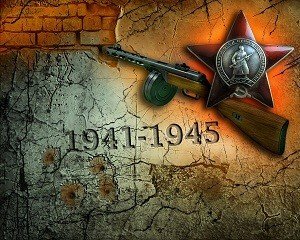 The war is also a very important topic in history books in Russian Federation. The sacrifices made by the Red Army soldiers and Soviet people in general to defeat the most nightmarish evil ever known are never to be forgotten. Every year in honor of this special day in every city in the country there are lots of various celebrations and parades. At the same time, although the 9th of May is the national holiday celebrated in a significant way, this is also a very sad day for every person on the territory of this country. Many people from all corners of the country have lost their beloved ones and close family members during this cruel war. On the one hand, everyone is happy that his or her Motherland wasn’t occupied by the Nazis. On the other hand, people are unhappy because of the fact that their country had to go through this terrible tragedy and face with countless losses. On this day people are grateful to their saviours, who exerted every effort to guarantee peaceful future. That is the main reason why people celebrate the 9th of May with honours. As a rule, all the celebrations are held using the most common symbols of Victory Day. For example, one may see how people are passing by with the St. George ribbon. They wear this ribbon of black-and-yellow color, they make sure to tie it to the antennas of their cars, showing remembrance and respect. To say more, they have red carnations. The thing is that blood red is the Soviet flag color. Under this flag (as well as color) the veterans have fought against Nazi Germany. In order to signify remembrance and mourning people lay an even number of red carnations at the war memorial sites. And of course one should mention the Red Star medal! This is a widely known military distinction for bravery. Thus, red carnations, the St. George ribbon and the Red Star medal are seen in the streets on the Victory Day. At the same time, some representatives of the younger generation do not understand how important this event is, which is absolutely disrespectful. In my opinion, the 9th of May is one of the most significant holidays on the planet. We have to be proud of all those people, who have died in order to give us an opportunity to live a bright and happy life. The thing is that if we do not take out lessons from our past, we won’t be able to face with the peaceful future.